The diabetes stats are downright staggering! Nearly 19 million people are diagnosed with diabetes in the U.S. and another 6 million are estimated to have diabetes but don’t yet know it. Add to this number, another 79 million people with prediabetes yet barely 10 percent of these throngs of people know they have it. Unfortunately people continue to think of type 2 diabetes as a ho-hum disease and tend not treat it early and aggressively. Yet we know early and aggressive care of type 2 is exactly what keeps people healthier longer. And we know early awareness and action with prediabetes can prevent/delay the progression to type 2 diabetes. I kicked off American Diabetes Month just a bit early with an appearance with Scott K. Johnson and Cherise Shockley of Diabetes Social Media Advocacy Live fame. It was a joyous way for me to celebrate the growth and strength of the ever-growing Diabetes Online Community. Take a listen and tune in Thursday nights at 9pm ET for much more on DSMA Live. Prediabetes: More, Many, Millions in Our Supermarket Aisles is a guest blog on Food, Nutrition and Science from the Lempert Report which focuses on prediabetes. I offered input straight from two supermarket dietitians on the front lines of the prediabetes epidemic along with insights into what people with prediabetes are asking. It's great to see RD, CDEs just where people need them - in the supermarket aisle! An interview with Melissa Dobbins, RD, CDE, owner of SoundBiteRD, Hope for Diabetes Care: Communications, Connections Can Create Change allowed me take a stroll down memory lane. I also offer learnings about work with the media, my dive into social media and how I've gotten to know and work with the Diabetes Online Community and many amazing Diabetes Advocates. Three videos, which I had the pleasure of taping with my colleague Jennifer Neily, MS, RD, of Neily on Nutrition fame, at the Academy of Nutrition and Dietetics annual meeting are up to view. Part 1 and Part 2 focus on prediabetes. Part 3 discusses differences between type 1 and 2 and details the management of both types of diabetes. A couple of guest blogs on Fooducate helped focus attention on diabetes and they're new app Diabetes Nutrition By Fooducate. The first, Got Diabetes? Necessary or Needless to Follow a 'Diabetic Diet' answers the question about whether there any longer is a “Diabetic Diet.” The second, The Path from Weight Gain to Insuln Resistance to Diabetes (type 2), walks through the important role insulin resistance plays in the development of prediabetes and type 2 with weight gain– it’s, as I say, at the center of the metabolic storm. An interview with Rachel Begun, RD, the Gluten Free RD, in which we explore the intersection of our expertise – hers on celiac disease, mine on type 1 diabetes in The Connection between Celiac Disease and Type 1 Diabetes. 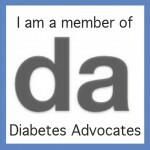 Onto 2013 and hopefully many more opportunities to raise diabetes (and prediabetes) awareness!